The Declaration of Friendship is an idea I have heard from other friends of mine and that I am building on. You could call this a sociology lesson maybe? 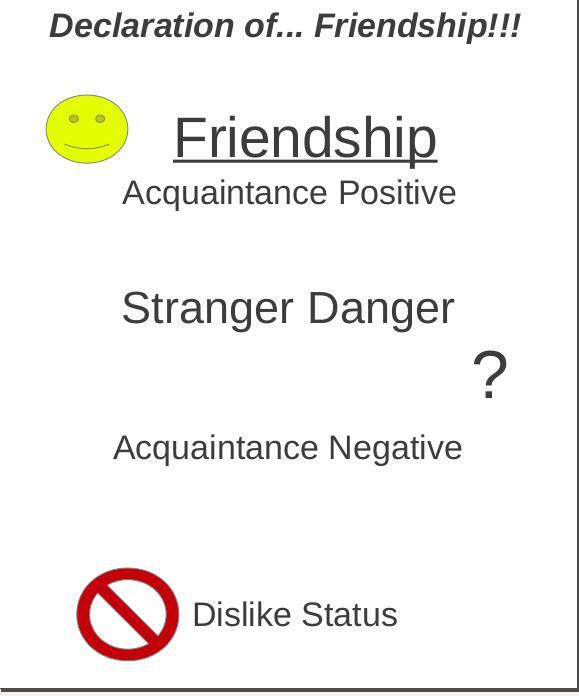 now we have what I would call the acquaintance level we will start off with negative and then go positive. Acquaintance Negative is someone who knows you and you don’t really like each other or get along very well but you will tolerate it. Until it goes to Dislike Status where you cant stand each other and very few people fall under this level for most people. Acquaintance Positive is someone you know who you enjoy being around when its easy for you to see them and some times cool stuff happens sometimes it doesn’t. I would say a majority of people would fall under this level. Its not a bad place to be but its not the top level of a social relationship either. Friendship this is the level that all other levels build on how do we define it? Who is a “True Friend”? How do we reach this level? Posted on December 30, 2012 by CRCJFLYNN. This entry was tagged backup, Friends, Fun, The Declaration of Friendship. Bookmark the permalink.